If you love your old windows like I do, but you hate the cold drafts that show up every winter, then I’ve got a simple solution for you that works all year round. I’ve talked a lot about weatherstripping windows with spring bronze, as well as all the other parts of the window restoration process on my resource page How To: Repair Old Wood Windows, but sometimes you don’t have the time or money for these more involved fixes. Don’t get me wrong, a properly restored and weatherstripped window can be just as energy efficient as a new window, but sometimes a simple fix is all you need or have time for. If that’s your case, then you need a new product I’m offering at The Craftsman Store called StopGap. 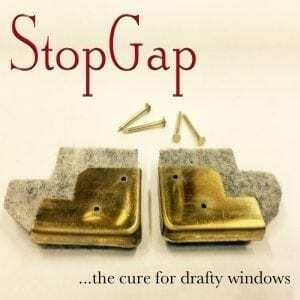 StopGap is a simple to install draft stopper that seals up the draftiest spot on almost all double hung windows, the parting bead/meeting rail junction. It’s made of thick felt and attractive solid bronze so that it will gracefully patina and blend in with your existing hardware. 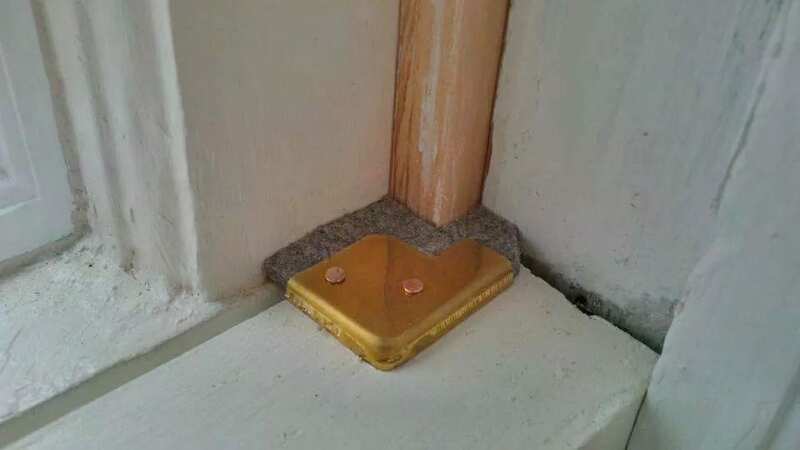 StopGap nestles snuggly in the corner of the window and attaches with two small coppered nails that are included. Once installed, it seals the gap that all double hung windows have at the meeting rail. The bronze holds it securely in place and the felt is flexible enough to seal the gap but still leave the window operable. Easy to install, attractive to look at, and great at stopping drafts. At around $10 per window, you can afford to do the whole house and save a bunch on your heating (and cooling) bills every month. I always want my readers to start with the low hanging fruit when it comes to repairing and upgrading their old homes, and StopGap fits that bill to a “T”. The biggest gains you can usually make in energy efficiency are with air sealing. While there are a few other ways you can effectively air seal windows, like by installing spring bronze or Indow Windows or exterior storms, StopGap is by far the least expensive option, so there is the quickest return on investment with the least upfront expense. And unlike a lot of other air sealing options for windows, StopGap seals the window while allowing it to still remain operable. Rope Caulk anyone? I hope you’re as excited as I am that we have this new product available! If you haven’t already, pick some up in The Craftsman Store, and get enough to do the whole house. The window in your photo doesn’t have a rope or chain. What distance is required between the parting bead and the chain/rope to install these properly? My windows have barely 1/2″. Laura, they were designed with a double hung window in mind as well hence the small notch at the interior right by where the rope will be. They will fit without modification on almost all 19th and 20th century double and single hung windows. Does this work on newer double hung windows. I got ripped off on windows 10 yrs ago & now I’m doubling paying for it with cold air. The photo makes it look like the Stop Gap would close the gable between the sash and window stop but would maintain a gap at the meeting rails. Can you explain it a bit further? Ken, the Meeting rail gap should be resolved by a proper fitting sash lock to pull it tight when closed. The StopGap closes the gap at the parting bead where there will always be a gap even when tuned up properly. Air sweeps around the side of the sash at this junction causing a lot of leakage. If the meeting rails are angled, as they should be, I put a silicone flap, let in to a grove made with a router on the bottom sash. It will wear out but they are cheap and can be replaced easily. That a great way to help tighten a Lois Meeting rail joint as well.